Although there is much discussion about what classifies as a two-berth these days (is a caravan with a fixed double bed and seating in the living area really a two-berth?) 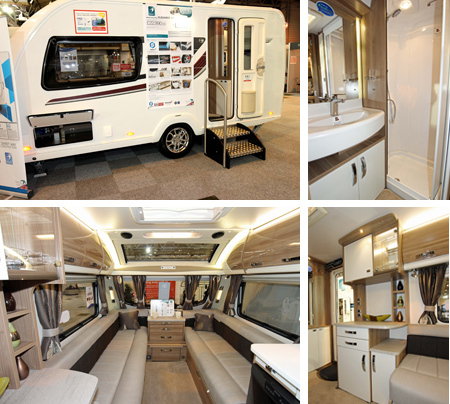 luxury two-berth caravans have remained a large part of the market, over the last few years despite the economic situation. In a recent readers’ poll we asked “Which new caravan or motorhome are you most excited to see?” Bailey, Coachman and Swift were revealed to have the most anticipated new models from the fifteen choices. With these results in mind, we have compared the top of the range two-berth models from the three manufacturers. To begin with, we looked at safety and security features and options, followed by weights and measures and overall value for money. It came as surprise to see that the Coachman VIP is the only one of our comparisons that doesn’t have a tracking device fitted as standard given the cost of the caravan. Like Caravan Guard, some insurance companies do favour tracking systems – we offer a 15% discounts on caravans that have a tracker fitted. Next we looked at weights and measures, a useful consideration when thinking of storing your caravan and for those who like to travel overseas, you need to know the length of your tow vehicle too. This information is also useful when booking pitches on some campsites, especially abroad. 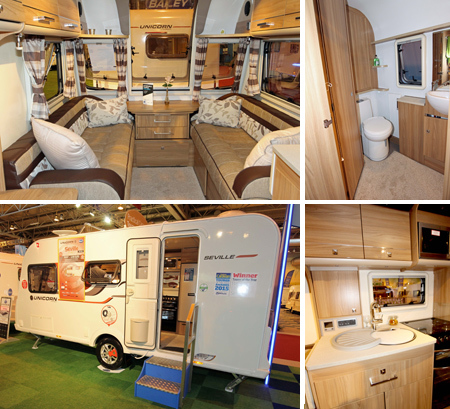 Internally, all three models have the same layout, featuring an end washroom, side kitchen and parallel front seating. Each model also has the ALDE radiator central heating and water heating system with touch screen control panel. The Seville’s double bed size measures 6ft 3ins x 6ft 6ins, the VIP comes in at 6ft 8ins x 5ft and the Elegance at 6ft 6 x 5ft10 ins. Looking at single bed make-up, both the Seville singles are 6ft 3ins x 2ft 2ins; the VIP also has both singles the same size at 6ft 1ins x 2ft 4ins. The Elegance is the exception with the nearside single measuring 6ft 2ins x 2ft 2ins and the offside just 5ft 10ins x 2ft 2ins. There is a high standard of equipment levels in all of the three caravans we compared, but they feature different ovens; the VIP and Elegance have the new Thetford Aspire 2 cooker which is aesthetically pleasing to look at and uses 6% lower gas consumption, reaches temperature 27% faster, has a 30% larger grilling area compared with its predecessor Aspire 1 and full sealing to the oven door to reduce the heat loss. The Seville, on the other hand, gets the inferior Thetford Caprice cooker so is beaten by the VIP and Elegance in this respect. Comparing the Aspire 2 to the Caprice is like compaing Prada to Primark. The Seville does also sport the new Dometic 133 litre tower fridge; Swift’s Dometic fridge has 110 litre capacity and a Thetford 113 litre fridge is fitted in the Coachman. There is much for the buyer to consider and each will have their own criteria to ruminate over before making a decision that involves a large sum of money. Tell us which of the three models you prefer and why using the comment box below. 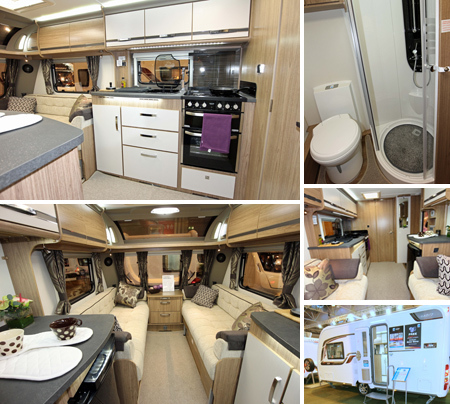 *Bailey caravan insurance cost based on 2015 Bailey Unicorn III Seville retailing at £19,525 fitted with hitchlock, Tracker Retrieve, AL-KO Secure wheel lock and Al-KO ATC. Kept on drive at HX4 0BE. Caravanners over 30 years old, claim free for 3 years and a member of a caravanning club. £100 excess. 180 days European cover and up to £75 per day for up to 15 days emergency accommodation cover included. Legal expenses cover, extended European cover and other emergency accommodation expenses cover options are available at extra cost. Quote includes 10% online discount and 6% Insurance Premium Tax and is correct as of 3/3/2015. **Coachman caravan insurance cost based on 2015 Coachman VIP 460/2 retailing at £22,195 fitted with hitchlock, wheel clamp, AL-KO Secure wheel lock and Al-KO ATC. Kept on drive at HX4 0BE. Caravanners over 30 years old, claim free for 3 years and a member of a caravanning club. £100 excess. 180 days European cover and up to £75 per day for up to 15 days emergency accommodation cover included. Legal expenses cover, extended European cover and other emergency accommodation expenses cover options are available at extra cost. Quote includes 10% online discount and 6% Insurance Premium Tax and is correct as of 3/3/2015. ***Swift caravan insurance cost based on 2015 Swift Elegance 480 retailing at £22,990 fitted with hitchlock, Tracker Retrieve, AL-KO Secure wheel lock and Al-KO ATC. Kept on drive at HX4 0BE. Caravanners over 30 years old, claim free for 3 years and a member of a caravanning club. £100 excess. 180 days European cover and up to £75 per day for up to 15 days emergency accommodation cover included. Legal expenses cover, extended European cover and other emergency accommodation expenses cover options are available at extra cost. Quote includes 10% online discount and 6% Insurance Premium Tax and is correct as of 3/3/2015. Purchased new coachman vip 460/2 nothing but trouble,heating packed in new circuit board,4 warped over bed doors,main door lock not functioning properly,discolouration to internal panel on main door,wardrobe lock faulty,and now back with dealer fridge packed in possibly nearly setting fire to van .Used twice since purchase phone coachman did not want to know take back to dealer where it currently sits. Hi Andrew, we’re sorry to hear that you’ve had problems with your VIP. Hopefully this is something your dealer and/or Coachman can rectify for you. Many thanks for getting in touch. We actually produced a guide on solar panels recently, click here for details. There’s also a guide on other modifications here. huge advantage of the coachman 460/2 is the wardrobe space in the rear washroom, and the worktop high working area next to the door opposite the sink / hob. Fantastic for long distance touring. I prefer the rear kitchen layout which is apparently unpopular with manufacturers these days. I like the build quality of the Bailey and its layout. For 2 bed caravans these all seem huge to me ! What size car would be needed to tow these ? Bearing in mind that a 2 berth is usually owned by a couple that wouldn’t generally require a large car. Personally i prefer my Go-Pod! Easily towable by virtually any car. So long as the car and caravan match up in terms of MTPLM and kerb weight. Click here to read our towing guide in full. We have a few tow car reviews on the website that might be of use, click here for details. I have a Coachman Laser with an L shaped lounge area. Anyone found out how to comfortably sit 4 persons round the table to eat ? It’s the only downside to the otherwise great van . In late September 2014 I was looking to replace my Unicorn Seville. I looked at all three ‘vans featured. My shortlist was Unicorn Seville 3 or Lunar Clubman CK. I chose the Lunar for various reasons (we all have our own fads and fancies). The Bailey was woefully deficient in regard to external locker provision. I would favour the Swift as the warranty is better. I have changed my Coachman Pastiche 460 2 berth for a Swift Challenger SE which although much shorter is a little lighter and easier to tow, yet still spacious where it matters. I was very disappointed with the build quality of the Coachman, mastic everywhere and not even smoothed down on the roof. No problems with the Swift, it looks and feels a class act. I cannot comment on the Bailey, as I do not have any experience of any of their models, but the interiors look appealing. Unfortunately I don’t like any of the caravans featured. Why, because I prefer the “L” shaped lounge area. Thats all.